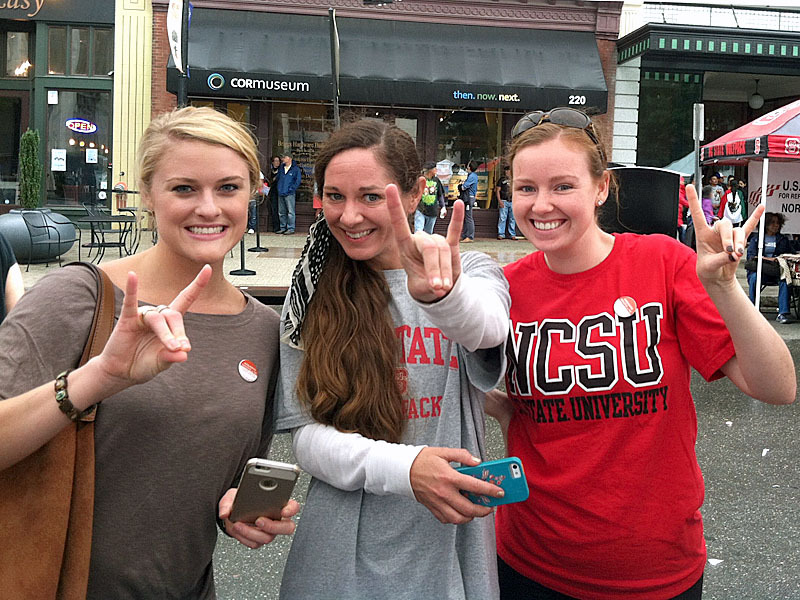 FLL faculty Rebecca Ronquest (center) and Caroline Sferruzzo (left), with graduate student Alex Hyler (right), showing their Wolfpack pride. On September 26, 2015 the Hispanic Linguistics Program participated in La Fiesta del Pueblo, an annual event that showcases Hispanic language and culture in North Carolina. During the event, Foreign Languages and Literatures faculty and graduate students engaged in several outreach activities including handing out free buttons with the phrase “Hablamos español en NC” (“We speak Spanish in NC”), and asking passersby to place a pushpin on a map indicating where they or their families came from. The event focused on celebrating the diversity of Spanish dialects represented in North Carolina, and on dispelling myths about Spanish in the United States. Students engaged in discussions with community members about the importance of Spanish to them and their families, and a documentary film crew from the North Carolina Language and Life Project was on hand to film a short piece on Spanish in NC. FLL Prof. Jim Michnowicz (center, with green NC map on black shirt) interviewing passersby for a short-film on Spanish in NC. The Hispanic Linguistics Program’s outreach activities are a good example of NC State’s approach to current society’s challenges — bringing together bright minds, encouraging bold thoughts, and putting the resulting ideas into action. Posted by S.F. Sotillo, with Jim Michnowicz. Professor Jim Michnowicz, We are very proud of your work at NC State, and glad to have you in our family!